So here we are at another Friday 13th. As those who have been reading my blog will know, I have had some disastrous Friday 13ths in the past. This time, I have been so busy I almost didn't have time to write a post for this morning - but I've got so much planned for today that I'm excited and wanted to share. And the thing I'm most looking forward to is having lunch at London's cat cafe - Lady Dinah's Cat Emporium. I've been wanting to visit ever since it opened, but it gets booked up so far in advance I kept not being able to make a reservation. However, perhaps there is something about the association between cats and bad luck that meant fewer people wanted to take a risk on a Friday the 13th of going to a place full of felines. I found a table was available and I booked it. 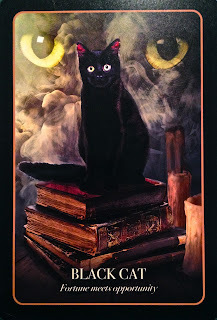 Personally, I don't think cats are bad luck at all - witches and cats are natural companions and I am sure the company of a bunch of friendly moggies can only make my day better. After that I am planning doing something else that the more superstitious minded might say was a tad unlucky - going for a walk in a graveyard. My list of resolutions for this year including going to Tower Hamlet's Cemetery - the only one of the Magnificent Seven Victorian cemeteries that I haven't yet seen. I thought I'd take the opportunity to tick another thing off the list while I was in East London and the weather forecast was good. Of course, being Friday 13, maybe that will change to dark and stormy. I've got my finger's crossed. And, apparently, there are a lot of cat-related superstitions about the weather. According to Are You Superstitious? by Lore Cowan, if a cat sneezes it is a sign of wet weather, and if it sits with its back to the fire there will be a storm. I'll be watching the cat cafe residents carefully for signs. In the evening, I have a ticket booked for a talk called Margaret Murray: Witchcraft theory and the ‘lunatic’ fringe? at The Petrie Museum of Egyptian Archaeology. Margaret Murray was an academic at University College London, which the museum is attached to. Although her theories on witchcraft, published in her book The Witch Cult in Western Europe are now largely discredited, her importance as one of the people who influenced and inspired modern pagan witchcraft is unquestionable. The talk should be interesting - but apparently I will need luck to be on my side to get a seat as it is completely sold out. If that isn't a busy enough day, In between all those things I am hoping to check out a pub that might be the venue for an exciting new monthly meeting, due to start next year. I can't give any more details yet, but watch this space. So, with such an event-packed day, taking in so many different things, what could go wrong - even if it is Friday 13? Do wish me luck. Photos: The picture at the top is from the Cat Wisdom Oracle.